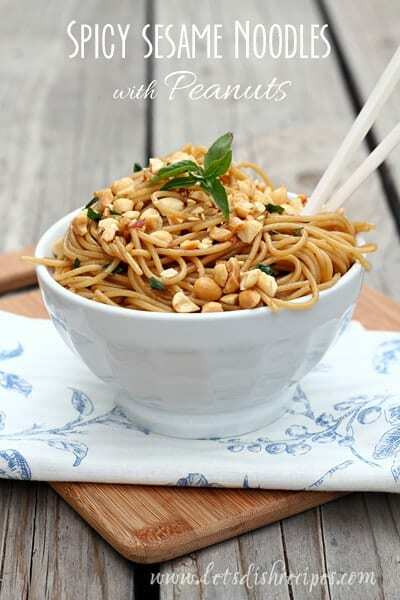 Every time I make these Easy Sesame Noodles I find myself wondering how something so quick and easy can be so delicious. These noodles take less than 15 minutes to make. That’s right. Fifteen minutes! And everyone in my family loves them. Even the picky eaters love these noodles. I’m talking about the ones who usually turn their noses up at anything other than butter on Parmesan cheese on their pasta. And did I mention it only takes 15 minutes to get this meal on the table? You can use Japanese noodles if your supermarket carries them, angel hair, or any other type of long, thin pasta. I often use red pepper flakes in place of the hot chili oil. And you easily adapt this recipe to include protein or vegetables. Serve these Easy Sesame Noodles with a green salad and you’ve got a complete meal in practically no time. Meanwhile, whisk remaining ingredients (except green onions) together in a large bowl. Pour drained noodles into bowl with soy sauce mixture and toss until noodles are evenly coated. 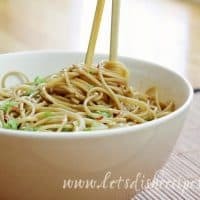 I make these same noodles from the PW and LOVE them! Sooo good! That looks and sounds fantastic! I’m bookmarking this, I bet it would be delicious with some grilled chicken. 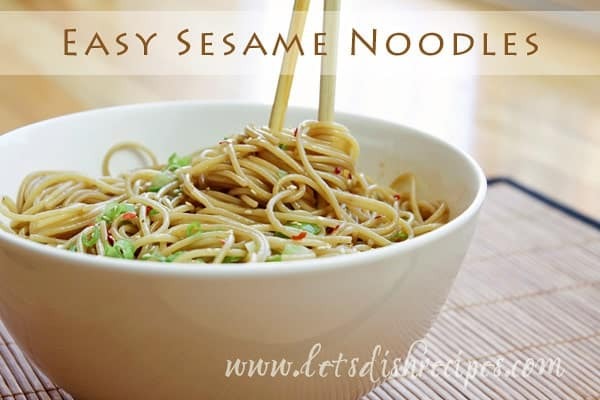 Sesame noodles are such a great comfort food! These are delicious! Simple and bursting with savory flavors. Love it! love to eat noodles espacially with duck meat at the elephant in England.. lovely..
YUM! I think I will add grilled chicken…thanks! Love this, easy and delicious flavors! sounds easy and delicious! I think it would be great with some grilled chicken or shrimp! I liked it. My adult daughter didn’t. I used linguine rather than spaghetti. The quantity of the sauce it made was way more than was needed, so if I make it again I will halve the amounts. Made this tonight, so yummy and easy! K A T A .
I recently went vegan so I have been looking for some good veggie/vegan recipes. Thanks so much for this, they were delish!! I liked this, but would not use the chili sauce next time! Too spicy for me! I also added broccoli! Yum! I made this tonight. It was delicious. I used rice bran oil instead of olive and threw in some sesame seeds as well.